Wed, Mar 20, 2019, 10:57 pm SL Time, ColomboPage News Desk, Sri Lanka. Mar 20, Colombo: Sri Lankan President Maithripala Sirisena says due to the broad programs launched within the past four years in preventing the kidney disease there is a reduction in the spread of kidney disease. The President made these remarks after vesting the 'Methsiri Sevana', the Kidney Patients Relief Service, Welfare and Research Center affiliated to the Anuradhapura General Hospital, today (20). The Center was built at a cost of Rs.437 million entirely utilizing the funds of the National Kidney Fund and without any funds of the state. Recently the first Center of this was opened by the President in Kandy. 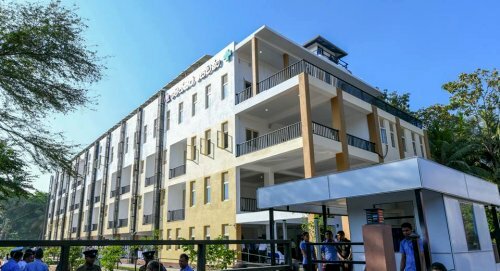 After opening the Center the President made an observational visit of the Center and registered the first patient to the 'Methsiri Sevana' , the Kidney Patients Relief Service, Welfare and Research Center. The President, using the remote satellite technology, declared open a 601 water purification system established at the circuit bungalow of the Ministry of Public Administration in Mihintale today. Several programs, including provision of domestic water filters to 2000 families of kidney patients, blood glucose meters to 200 kidney patients and Blood Pressure Monitors to the North Central Province Ministry of Health were held under the President's patronage. The President also presented awards and certificates to winners of the competitions held Island wide among the school children under the theme 'prevention of kidney disease'. The President also thanked persons who engaged in the construction of the Kidney Relief and Welfare Center. The National Kidney Trust Fund, established by President Sirisena utilizing funds raised for his election campaign, has become a strong fund with the assistance of local and foreign donors. Utilizing the Fund, many projects have been implemented, including the welfare activities of kidney patients, providing facilities needed for treatments, providing contribution for the research activities implemented to the prevention of kidney disease and to provide clean drinking water facilities for areas vulnerable to kidney disease.